There are things that it may be better to do alone (although to be honest I can't think of any, or maybe cuddling the cat, so to have him all for yourself? But even in this case there's room for discussion...), and others for which it is best to have a co-pilot. Going to the amusement park, crying over a broken love affair, playing darts or hide and seek, eating a fiorentina steak or making a toast to the new year: these are all experiences that call for a navigator. Call it what you want, strolling buddy, coffee break friend, or co-pilot, his job remains the same. He is the one who cushions your falls, doubles the fun, and endorses the emotions; a happiness amplifier and a compass to not get lost, depending on needs and circumstances. Making jam is one of them, a ritual so nostalgic, sleek and intoxicating that having a co-pilot becomes essential. To make jam you need a ladle companion, a friend with the easy smile who keeps track of how many times you've blanched the peels, or turns the spoon for you when you need a break for the usual photo; one that is moved as much as you when the house is filled with dense, tart and sweet aromas, and that while waiting for his turn just sits listening in silence, but with the heart always on alert. The co-pilot may not be an expert in jam, but if it is too bitter he'll tell you loud and clear and perhaps in exchange he'll offer a soft candy or a jar of roasted hazelnuts. 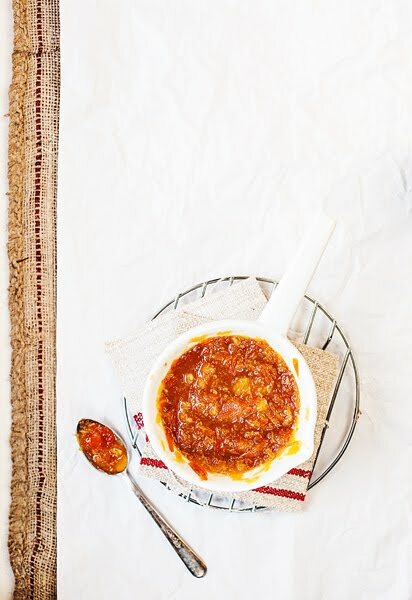 The orange marmalade co-pilot is also who tastes it with you, the next day, on a slice of toast for breakfast, watching the snow and dreaming of spring; or who gives you a recipe like this to share its bittersweet magic. An unexpected friend, found after years wandering around familiar paths, one of those who could teach you again how to ride a bike and whom you could count on for a spare battery. With him you can run on the grass screaming your favorite song out of tune, or lie down and watch the clouds breathing clean air in silence; he is made for walking together on winter afternoons, and then returning home to share jars and recipes with no fear of having done something wrong. 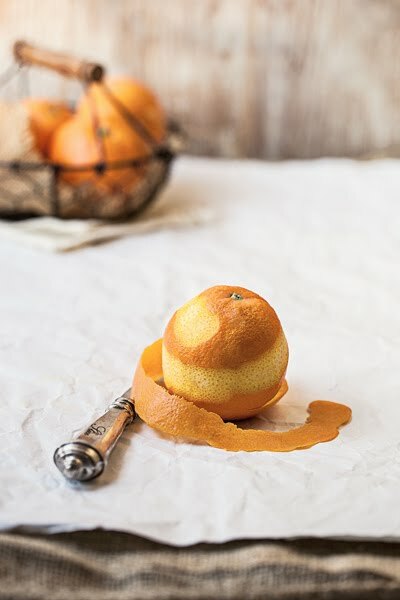 With a potato peeler or a sharp knife, remove the outer part of the orange rind, leaving out the white portion. Cut into thin slices and blanch in boiling water for 10 min. Drain and repeat two more times, always changing the water. Peel the oranges to the flesh, remove seeds and thin membrane and cut them into pieces. Cook for about 10 minutes in a large pot, and then add the softened rinds and honey. Cook over medium heat, stirring frequently, until jam reaches the desired consistency. Pour it in glass jars and sterilize them as usual. Before even finishing typing the recipe and definitely before publishing it into the world, I spountaneously hand myself over to the vegan police and confess my crime. For those who don't know, honey is not vegan, and I commit sin, BIG TIME! But since the world began, every rule has its exception, and my vegan world - for now - has three. One of these is called honey, the other two - for now - I'll leave it to you to guess. And finally, badabum badabum, I inform you with great pleasure that this recipe marks the beginning of my collaboration with the magazine NB - Nero su Bianco, a monthly publication of news, culture and opinions directly from that beautiful town of mine, wedged between rose mountains, shooting stars and endless skies, queen of hearts Cortina d'Ampezzo. If you're not shy, I leave you the link and my blessing to take a look at their facebook page. I like! This is such a sweet post. I love the idea of having a co-pilot, and am lucky to have one myself! Co-pilots are great in many instances. Apparently marmalade is one! I love how vibrantly orange this is, and even though honey is not vegan, it sounds like a fantastic addition. How much water do you recommend when doing the last boil? Since you're adding the honey and rinds to the water (and I assume you don't want to dilute the honey too much, causing it to boil off) I would assume the amount of water might be useful. Beautiful detailed recipe. I never add water to my marmalade, just use the fruit juice - if you add water you only increase the boiling time. tҺіs wonderful piece of writing аt Һere. Any sort of brand identity selling any item is going to do far better whether they have all well-known confront behind the fact that. Granted, for anybody who is well-known best replica Patek Philippe watches then one will only fically your girlfriend or himself alongside brands which are often respected, well-known and would manage paying effectively Cheap Replica Watches Australia for getting the replique montres particular legal rights in an effort to plaster a good famous confront all over what it is actually marketing, whether water (Jennifer Aniston replica Chopard watches related to SmartWater), footwear (anyone replica MontBlanc watches that get some issue backed Nike), and so, high-class fashionable watches. Luxurious discover makes have most of the actual traits that prepare them have the ability as a way to pay to your (in most cases) huge amount of money that these do to any or all types for superstars. Say it more than 50 per cent of the time I run into brick walls, says Dent. Heard complaints about law enforcement not being able to uncover or to properly investigate many transactions. Because they can find out the true owners of certain companies. So you think that it in the best interest of government to have a more transparent system of identifying who are the true owners of a company. Is one of the most opaque jurisdictions, globally, in terms of identifying corporate ownership. Professor Matthew Loscalzo, a specialist in pain management at City of Hope, said, "We know that music makes people less anxious. We know that people Sac Longchamp Solde who listen to music and experience it deeply feel less pain. That is Oakley Sunglasses Sale UK science. I am a huge fan of Ray Ban Sunglasses Sale UK Will Bolsos Michael Kors Baratos Ferrel, and in fact, I said (before I knew that he was replacing Carell) that Will Ferrel is the only person in Hollywood that can replace Carell. I could not think of anyone else that could keep the show running. I did think that his performance Michael Kors Purses Clearance was somewhat mediocre, but I think it was because the focus of the show was on Longchamp Soldes Destockage Michael.